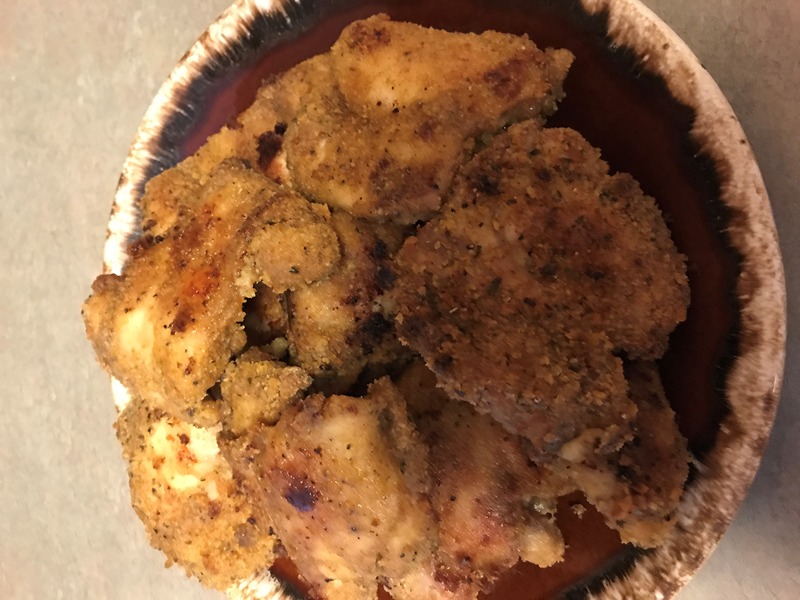 Look no further for the most delicious and easy Oven Fried Chicken recipe. Full of outstanding savory flavor, this chicken is moist on the inside and crunchy on the outside. If you love fried chicken but not all of the grease which comes with it or the extra calories. Then we got you covered. 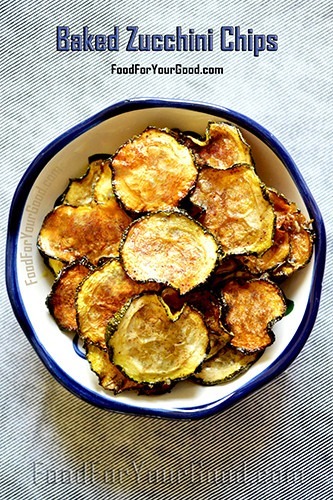 No fryer required with this one of a kind favorite recipe which is a must try. 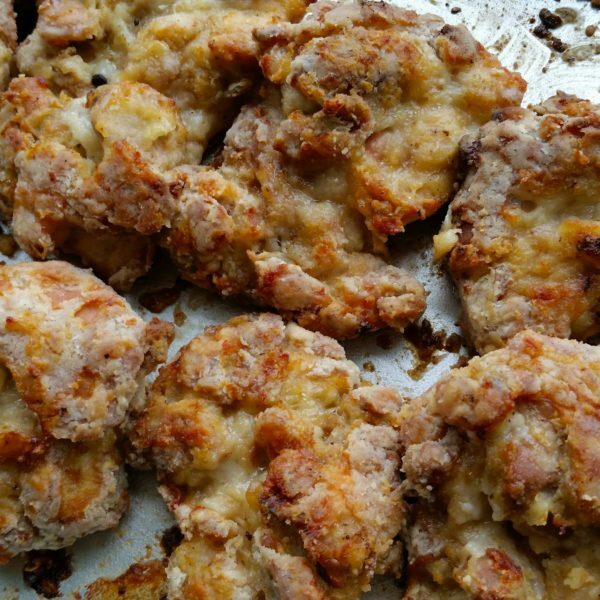 Easy to make, these delightful chicken thighs are ready in about 45 minutes and will become so tender and delicious that you will never go back to your old ways. 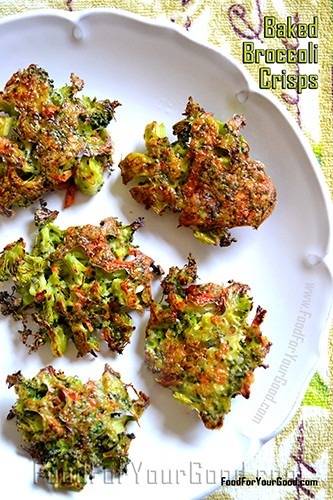 We recommend using a non-stick baking tray for an easy and speedy cleaning. 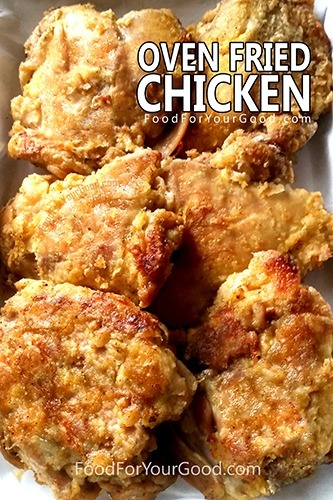 We hope you will enjoy this Oven Fried Chicken recipe from our Food For Your Good test kitchen. 2. Rinse the chicken thoroughly and pat dry. 3. Mix all spices together. 4. In a separate bowl add half of the seasoning mix to the Sunflower oil. 5. Add another half of the seasoning mix to the separate bowl with a flour. 6. Brush each chicken thigh thoroughly with the oil and spice mixture and rub well with the flour mix. 7. Place chicken on a non-stick baking tray. 8. Bake chicken for 30 to 35 minutes at 300 F. Then turn oven to 475 F and bake for 15 minutes (flip chicken during the middle of the cooking process) until golden and crispy and a minimum internal temperature of 165 F or greater as measured by a meat thermometer. 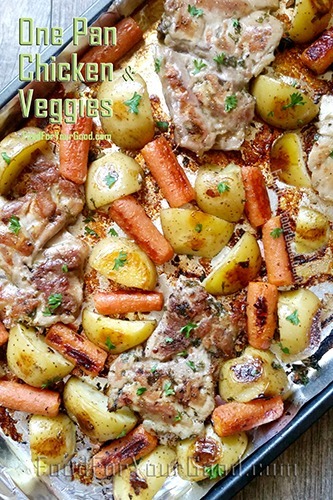 NOTE: *** This recipe was created for boneless and skinless chicken thighs ONLY. 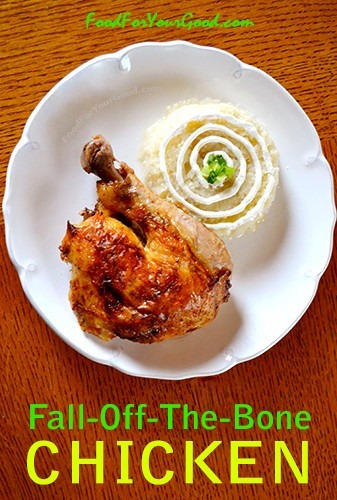 If you replace with bone-in chicken it will take longer to cook and may not come out right. I took the advice from other responses and doubled the spices and only used 1 cup of flour and still had some left over. I also used the last bit of bread crumbs i had left over. It turned out great! I am going to try this as soon as I buy the thighs! I will brine them first because I use bone-in skin-on & don’t want them drying out. I will do as others suggest and use less flour but for my 1st try I will use the seasonings as stated. First, I’m not a good cook. I called my son about the flour comments and he said “mom”, just use panko. I had some and followed most of the instructions substituting some spices (Italian seasoning instead of oregano and the like) and I have to say, it worked GREAT! I didn’t really measure the seasonings and took the advice from a comment that said to marinate the chicken for an hour. YUMMY!!! Thank you so much! I followed the recipe to the T and I ended up having to throw it in the air dryer afterwards because it was soggy. Not sure what I did wrong but I’ll be sticking to the air fryer. I added a ton of my own flavors so it came out flavorful. Made this but took some advice and reduced that flour and added more than double the spices. Marinated the thighs in the seasoned oil for an hour prior to baking. Definitely used foil for easy clean-up. Chicken was very good and moist and spicy. But even better as chicken salad the next day. Chunked the chicken, added diced red onion, worcester sauce and mayo. Amazing flavor from the flour/spices. Thank you so much for sharing your experience with us, Elizabeth. We’re glad you enjoyed it! I made this chicken tonight substituted the boneless for bone-in, had to cook longer but it was absolutely delicious. The seasoning was really on point. Thank you for your review, Sonethia! We appreciate it! That’s a great question Amber. You start counting the 15 additional minutes when you turn the oven up. Tried this tonight and while I love the convenience it was “flour” tasting. I will make it again but will likely salt and pepper the thighs and leave them in the oil for 30 mins. Also, will adjust the temperature as: 20 mins at 325; raise to 475 cook for 10 mins; turn and cook for 10 mins more. I will also use about 1/3 of the flour. I really like the ease and the bottom was crispy so with a few tweaks it will be one of my go tos! Thanks for pinning Kate! I made this and loved it. Just wondering if I could make chicken fried steak, or onion rings with the same process? Thank you Gary! I believe the same process will not work for the chicken fried steak or onion rings. Simply it will become too dry in the oven. We hope it was a success, Jane. Thank you kindly for your review! 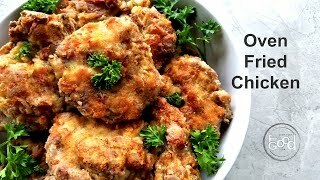 Can I use chicken breast in this recipe? Using chicken breast is not recommended, Mrs C. It tends to become out too dry. Made this tonight and I’ll need to tweet it if I make it again. I had to extend the cooking time because it was still mushy. Also, it just tasted like flour. I think two cups was way too much for the amount of chicken in this recipe. I ended up adding a lot of salt at the end. It’s a good idea and it LOOKED really good. Just needs more spices. Thank you for your feedback, Hillary. We appreciate it! Ruined my non stick baking sheet–highest temp they are supposed to be subjected to is 425, I felt 2 cups of lour was WAY too much, so only used 1 cup w/spices. Still had to throw away most of it. If I had turned the chicken half way through the first baking at 300 perhaps the coating would have adhered, however, I turned the chicken pieces half way through the second baking , at 475, and the coating stuck to the pan. Also made a mess of my oven—BUT, the flavor was exceptional, so I will “tweek ” the recipe and try again. I made this today, using olive oil and bone-in chicken thighs. I roasted it at 425 for 45 minutes, and it was perfect! I will definitely use this super-simple recipe again. Sandi, thank you for your kind words, we really do appreciate it! I have this in the oven at this moment, hoping it turns out well. 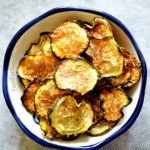 I used vegetable oil to substitute the sunflower oil…just didn’t have any. I did do a little bit of olive oil combined but still 4 tablespoons total. 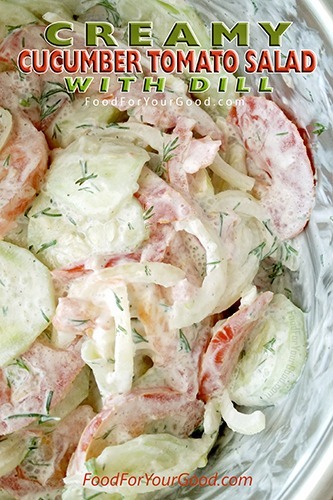 I love this recipe and I cook it often. I’ve tried both: boneless and skinless chicken thighs as per the recipe description and with bone-in and skin on. I find that boneless and skinless chicken thighs taste much better than bone-in. Also, I tried to cook a larger amount of the chicken and it needed to cook longer and it was not as tasty. So I always follow this recipe to a tee and I always have a great result and my family enjoy it as well. Thank you for taking the time to review, Renee. We appreciate it! This is in the oven as I type. Excited to see how it comes out. Smells amazing! Thanks for sharing. Really delicious. I cooked them on a baking sheet, lined with a non-stick aluminum foil. This turned out to be a nice alternative to fried chicken. So happy to hear that. Thank you for your review, Nicole! I make meals for our work crew, so when I saw all the wonderful reviews I decided to try it. I’m very sorry I did, wasted a ton of chicken. For starters I added a bit more spices but other than that followed the recipe exactly. It had no flavour, and the chicken did not get crispy, I ended pan frying it at the end to try and make it less soggy looking. Needless to say it tasted like flour on seasonless chicken. Will not make again. Thank you for the review, Michelle. Sorry, it did not go well for you. I’m not sure what went wrong, especially with the flavor if you doubled the spices. Did you have more than 8 pieces of chicken? If so, adjusting cooking time and temperature will help. But I recommend to follow the exact recipe and make one batch first. Personally, I make this chicken every other week, and it’s one of my favorite recipes. I had the same issue. It was very floury. I wonder what went wrong? Haley, you may need to adjust the oven temperature/cooking time. It should not taste floury. Cook it until golden and crispy and a minimum internal temperature of 165 F or greater as measured by a meat thermometer. I don’t follow recipes to the T, what to do is season the chicken first with the seasoning and season salt and put the in fridge for a day or a couple hours, then follow the recipe don’t [put the seasoning in the oil only in the flour. Put in the chicken in the oven on low heat ( not high ) for 2 hours because it has bones when you start to smell the chicken aroma , you now know you have to put up the heat in the oven for about hour keep on eye on it until you are happy with it . Made this last night for dinner and it was a hit with the husband and kids. We love spicy food so I used a lot of paprika and cayenne powder. After reading the reviews of people complaining about it being too floury and bland I used a cup of flour only at most and I made sure there was enough salt in the oil marinade. If you think you’ve added enough salt add more, trust me. I used a wisk to mix the oil marinade and gave it a little taste before adding the chicken. Once I was happy with the flavor I just added the chicken, I didn’t have time to let it marinade so into the flour it went an popped it the oven. I didn’t measure any of the spices out I just eyed it and tasted, it came out delicious! You’ll be successful if you use less flour, the recipe calls for too much and too little spices. Don’t be afraid to taste the oil, just a little dip with a spoon is enough, you don’t have to take a spoonful. The cooking time and temps are spot on though, if you want it crispier just leave it a little longer. I don’t think you’ll get a true fried crisp, after all it’s supposed to be healthier as it’s baked but this is going into our dinner “rotation” as requested by the kids. Tried this recipe and it was great.. i tried to double dip and flour and it didn’t so well. Just one layer as directions say and it was really quite tasty. Hi! Can we use any oil or is the sunflower oil imperative? Hi Jaymie, any oil for frying will work. This looks great. Will I need to change the cooking time or temp if it is bone in? Thank you, Teresa. Each oven has a variance in cooking temperature. Please, keep the temperature and cooking time as per recipe but you can increase it if needed. Your chicken will be fully cooked at the minimum internal temperature of 165 F or greater as measured by a meat thermometer. 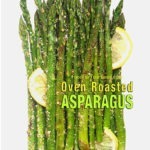 I’m making this for the second time tonight and even my picky boys love it! Will this work with bone-in/skin-on thighs? It’s MUCH cheaper to buy that way. And… I know that the skin adds some fat, but I LOVE it! It’s a great question, John. We do love bone-in chicken too! Yes, it will work. You can give it a try. 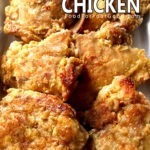 The best oven fried chicken ever. 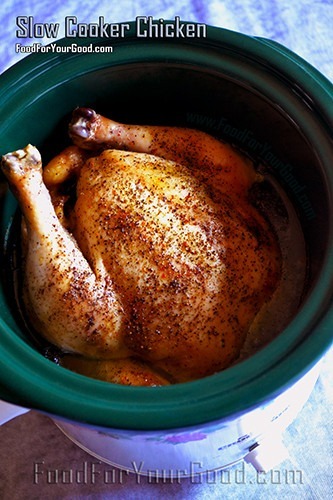 The chicken comes out so juicy and moist on the inside and crunchy on the outside. Better than take out fried chicken. Thanks for the recipe. I gotta try this one! Looks like it taste so good.